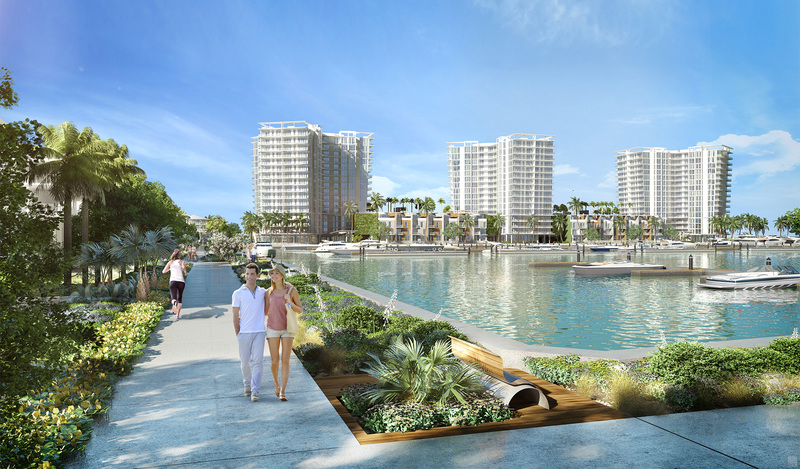 BTI Partners, based in Fort Lauderdale, is the master developer of the district. BTI is also developing three condo towers within the district as well as the retail space. After selling off several tracts to residential builders and seeing high demand for its own condos, BTI shifted its focus to the retail portion of the district in June. Just back from the International Council of Shopping Centers’ statewide meeting in Orlando — an annual gathering of retail real estate professionals — Beck Daniel, executive vice president of development for BTI, shared an update on the project with the Tampa Bay Business Journal. The district’s town center includes 22,050 square feet of retail; a waterfront parcel fronting Gandy Boulevard can accommodate a 10,000-square-foot restaurant. The ground floor of the first condo tower, Marina Pointe, has 10,000 square feet of retail, and another parcel, along Gandy Boulevard, will be home to 15,000 square feet of retail and office space.